Costa Rica is already a hugely popular vacation destination with its rain forests, volcanoes, hot springs, Pacific and Caribbean beaches, coral reefs, six different climatic zones, welcoming culture and breathtaking beauty. Pura Vida! is the common greeting used here, meaning Pure Life! At just 2.5 hours direct flight from Miami, this Central American paradise is bordered by Panama and Nicaragua, with year-round sunshine and a wealth of riches to explore. Costa Rica has about 0.25% of the world’s landmass and contains 5% of the world’s biodiversity – so there’s plenty of natural beauty to explore. Around 25% of the country is protected and conserved as national parks, indigenous reserves etc – and with a population of just 4.7 million people, there’s plenty of room for visitors! In 2013 alone, Costa Rica welcomed 2.2 million visitors. Costa Rica has ranked number 1 in the Happy Planet Index since 2009, acknowledged as being a country which delivers long, happy and sustainable lives for its population. In 1949 Costa Rica took the pioneering decision to dissolve its national army and invest instead in education and this has paid off with a highly educated workforce and political and economic stability. The country has been a democracy for nearly 100 years. 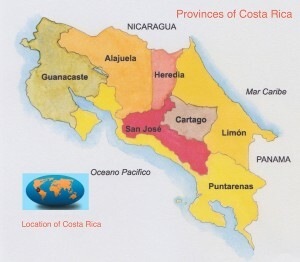 Costa Rica is divided into 7 provinces – San Jose, Guanacaste, Alajuela, Heredia, Cartago, Limon and Puntarenas. The capital is San Jose in the province of San Jose. There are 2 international airports San Jose International Airport (SJO) in the province of Alajuela, officially named Juan Santamaria International Airport and Liberia International Airport (LIR) in the province of Guanacaste, officially named Daniel Oduber Quiros International Airport. For information on direct flights to these international airports, please see Airlines. Costa Rica is already accustomed to receiving a huge number of international tourists each year and this infrastructure allows an easy transition into Medical Vacations in Costa Rica. Many professionals in the educated workforce will have studied at Universities both inside and outside of Costa Rica and have international training and experience and an excellent level of English. The attention to customer care and a VIP level of service wherever you travel in Costa Rica, is an important factor in attracting travellers on vacation and health vacations. Many hospitals and clinics have actively sought to apply the same or better standards than their counterparts in US and Canada, by going through the rigorous process of International Accreditation with American Accreditation organisations such as JCI, AAAASF, AAAHC or Canadian Accreditation organisations such as Accreditation Canada. For more information, please see Quality Providers. At Medical Tourism Costa Rica. com, we promote such quality in our Directory of Providers, enabling you to easily find and personally assess quality information on quality providers of medical tourism here in Costa Rica. As a result, Costa Rica ranked third in the most visited medical vacation destinations for the estimated 900,000 North Americans who left the US for medical travel in 2013. (Patients Beyond Borders & Reuters, February 2014). The main centres of medical tourism are in the provinces of San Jose and Guanacaste, due to Airline connections and Internationally Accredited facilities. Costa Rica’s secure tourist infrastructure makes it perfect for exploring before or after your medical trip, so take time to enjoy this beautiful country while you are here. Click here for more information on popular tourist destinations in Costa Rica. Climate Costa Rica welcomes visitors with a smile and warm weather at any time of year. There are just 2 seasons in Costa Rica – the green (rainy) season from May to November when there is beautiful sunshine in the morning and a few hours of rain in the afternoon. The dry season is from December to April. The average all year round temperature is 72 to 81 degrees Fahrenheit. Passport When travelling to Costa Rica you must have a valid passport for at least 6 months beyond your date of travel. You must carry your passport as identification when entering a hospital or clinic. Carry a good book. You may have to wait in line for your treatment provider. It is a good sign as they are popular! Transport. Costa Rica has an excellent bus and coach network, though you may prefer to rent a car or contract a private driver for your stay. Taxis are inexpensive, just ensure you use a registered red taxi with a yellow triangle on the side, or the bright orange official airport taxis. Many medical tourism services in Costa Rica, provide a collection service from the airport to welcome their guests. Further information for general information on Costa Rica see CIA World Fact Book for more specific information on Costa Rica, visit the Costa Rican Tourism Board (ICT) website.